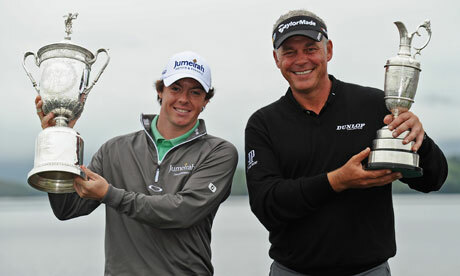 Northern Irish golfers Darren Clarke and Rory McIlroy have both received awards in the New Year Honours list. Clarke won the 140th Open Championship at Royal St George's in July at the age of 42, firing a final round 70 to beat Americans Phil Mickelson and Dustin Johnson. Clarke is rewarded with an OBE for winning his first major, after twenty years of trying. "It is a great honour and a fantastic way to end a great year. I am very proud for me and my family," said Clarke. Clarke added: "I have had a fantastic year and this just caps it off. "It is a privilege to be recognised with an OBE. It is a lot to take in. "I could not have envisaged the year I have had. Winning The Open was obviously a dream come true, and it was at the 20th attempt. "I had chances before and at 42 thought that maybe it was just not to be. "It was a life-changing moment really and in many ways my feet have not touched the floor since. And now this. "It reflects everything I have achieved in the game which makes me feel very proud." McIlroy has been awarded an MBE six months after his US Open win. The 22-year-old recorded a tournament record score of 16-under-par 268 at Congressional to win by eight shots. McIlroy said: "I am delighted to be named in the Queen's New Year Honours list. "It is quite humbling to be included in such a list of worthy recipients.